"My skin gets worse during the shows because of all the travelling, so I prepare at the beginning of the season by having Venus Freeze Face Lift Facials, which zap heat onto your skin. 'You come out with plump skin because it helps to create collagen. 'Dude, it's insane,' the fashion darling said." 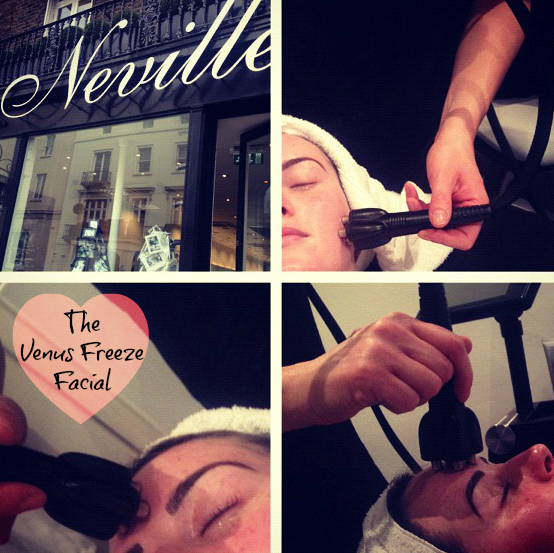 That's right, THE model of the moment, Miss Cara Delevigne herself, swears by The Venus Freeze Facial to keep her face looking fabulous for fashion week. Being the skincare sheep that I am I leapt headfirst onto the bandwagon and booked myself in for an appointment at Neville Hair and Beauty in Belgravia, Chelsea. The Salon itself is absolutely divine, regularly frequented by the likes of the Made in Chelsea Cast, The Delevignes and Prince Harry's latest squeeze Florence Brudenell Bruce, it oozes sophistication and understated chic. Clare-Marie was my facialist and was incredibly knowledgeable about the treatment and explained how it it operates by combining Pulse Magnetic Fields (MP2) and Radio Frequency (RF) to raise the temperature of the skin. This causes controlled thermal damage and thereby stimulating the skin to repair itself, producing new collagen and elastin leaving skin glowing, plumped and tightened. After the usual facial-double-cleanse, a layer of glycerin was applied to my face and Clare began moving the handpiece over my face. As this is a facial that promises results I was preparing myself with the old 'No Pain-No Gain!' mantra but was joyously surprised to find that the sensation was of a relaxing, warm massage to my face which I found most enjoyable and actually felt very sad when Clare told me it was all over! The results were immediate and my skin was ever so slightly pink but felt extremely comfortable and looked glowing and much plumper. The noticeable difference remained for about two weeks and is one of the few facials I have experienced that has absolutely NO downtime and immediate effectiveness. I would absolutely recommend this for a special event facial - it would be absolutely PERFECT for a big day such as a wedding or important birthday/event! I will definitely be heading back before I am a bridesmaid in June.